We just exchanged gifts with my younger brother and his fiance yesterday because they are going to be with her family this Christmas, so I can share this now. This was one of my favorite things I made this year for presents and it was also super quick to make. I was very, very, very tempted to keep it for myself. I found this chunky, hand spun looking yarn at some store on clearance for a dollar a while ago. My future sister in law loves purple, so I knew I was going to maker her something. I went with a really big plastic crochet hook and just single crocheted it to the length and width I wanted. 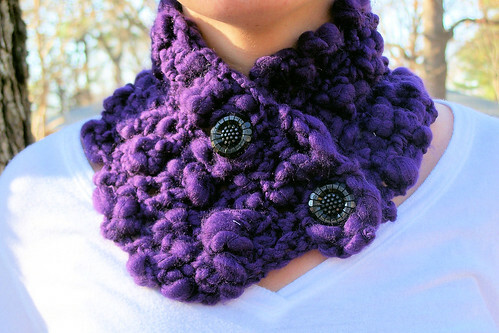 Then I just sewed on two pretty black buttons and viola, a beautiful neck warmer. it’s beautiful and i love it! thank you so much! You know, sometimes the simplest projects make the most beautiful results. 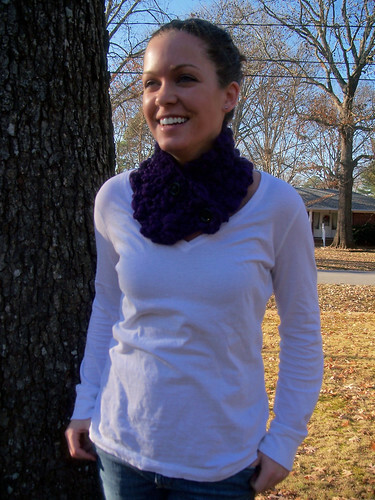 Love the purple neck warmer. Great incentive for me to make myself a little something. Thanks, Jessica, I’m really enjoying your inspiring blog!